The launching point for the development of the Ninja H2 was a strong desire to offer riders something they had never before experienced. Convinced that a truly extraordinary riding experience would not be found on a motorcycle that merely built on the performance of existing models, the design team committed to developing the “ultimate” motorcycle from a clean slate. The bike needed to deliver intense acceleration and an ultra-high top speed, coupled with supersport-level circuit performance. To realise this goal, help was enlisted from other companies in the Kawasaki Heavy Industries (KHI) Group, precipitating an unprecedented level of inter-company collaboration. Development pursued two paths. The first was a closed-course model (Ninja H2R) that allowed an unadulterated pursuit of performance free of the limitations that street riding would impose. This was followed by a street model (Ninja H2), based closely on the closed-course model, that would meet all market regulations. The results were incredible, with both models offering a sensory experience surpassing anything that riders can find today. The Ninja H2 is powered by a supercharged engine based closely on that developed for the over 300 PS Ninja H2R. High output notwithstanding, the compact design is on par with power units found in supersport litre-class models. The key to achieving this incredible performance lies in the engine’s supercharger—a motorcycle-specific unit designed completely in-house with technology from the Gas Turbine & Machinery Company, Aerospace Company and Corporate Technology Division.KHI Group technology was not limited to the supercharger. Advanced technological know-how shared from other group companies is found throughout the innovative engine and chassis designs. 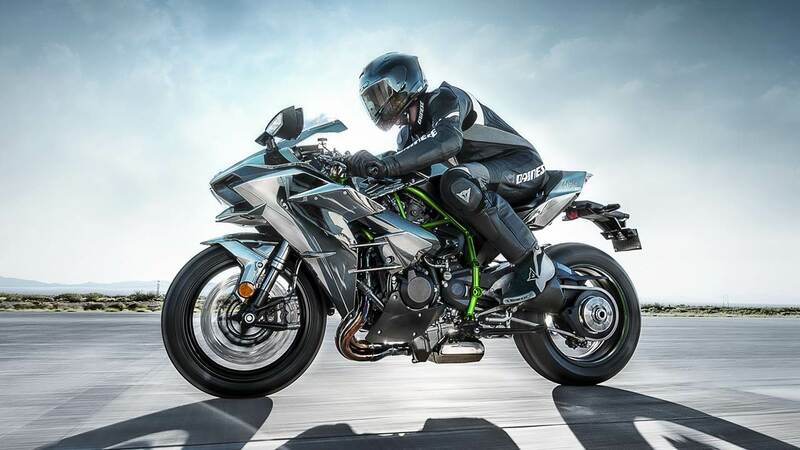 For example, the aerodynamic mirror stays that add stability for high-speed riding were designed with assistance from Kawasaki’s Aerospace Company. This is only one of many examples, but such inter-company collaboration and the level of resultant technology poured into this model is the reason the Kawasaki River Mark is displayed prominently on the upper cowl. When it came time to name this model, using “Ninja”—a name synonymous with Kawasaki performance and shared by many legendary models over the years—was an obvious choice. But it is also named for another epoch-making model: the “H2” (also known as the 750SS Mach IV), powered by a 2-stroke 748 cm3 Triple, had an intense acceleration that made it a worldwide sensation. For a model that delivers supersport-level handling coupled with the kind of acceleration no rider has experienced before, we can think of no better name. Front: Type: φ43 mm inverted fork with rebound and compression damping, spring preload adjustability and top-out springs. Rear: Type: New Uni-Trak with gas-charged shock, piggyback reservoir, dual-range (high/low-speed) compression damping, rebound damping and preload adjustability, and top-out spring.